Media Player Classic - Home Cinema 2018 (MPC-HC) is a free media player that play almost all media files available on the web, which maintains a classic design from old media players. We can consider MPC-HC is the full and modern alternative for Media Player classic. MPC-HC supports a wide range of operating systems Windows 10, XP SP3, Vista, 7, 8, 8.1, and its supports computers with older processors, Great! Media Player Classic 2018 dwonload is an enhanced version of Media Player Classic original, which has been discontinued support for it, the basic features: fast to run and easy to use, with a simple interface makes it easy to use by anyone,you can explore the advanced features easily by yourself after downloading the software and run it. 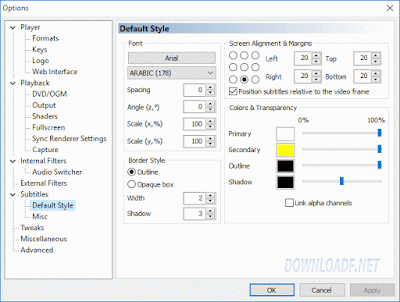 Video formats, supported by Media Player Classic 2018 latest version (MPC-HC) MP4, MPEG-2, MPEG-4, VCD, SVCD, DVD, XCD, AAC, H.264, VC-1, MPEG-1, DIVX, XVID, FLV, MKV, AVI, WMV3, MOV, WMV, SWF, VP30 / 31, OGM, SIPR, DXVA and ALAC. Audio files and images supported by Media Player Classic (MPCHC) WAV, SND, AU, AIF, AIFC, AIFF, WMA, MP3, OGG, MIDI, MPEG, ASX, M3U, PLS, CDA, MPG, MP2, VOB, AC3, WAX, ASF, WM, WMA , DTS, JPEG, JPG, GIF, PNG, BMP, D2V and QT. What's makes the application, save memory, take off the heavy interfaces and replaced with a simple clean interface. And stop creating libraries that could consume computer resources. The application natively supports formats such as MPG, AVI, DVD, and SVCD / CVD. However, to support other formats such as MKV, RMVB and MP4, installing additional codecs are needed. Amid so many options, it allows you to capture images from video, add subtitles, make even more minimalist interface and make the application window stay above others, allowing viewing without interruption. There are also options to run in full screen, zoom in, zoom out and even change the style of the video - display in 16: 9 (Cinema) or 4: 3 (TVs and old monitors). 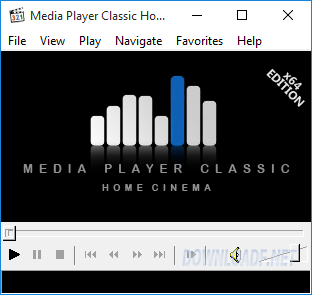 Media Player Classic Home Cinema 2018 for Windows 32-bit & 64-bit (Direct Download Link).